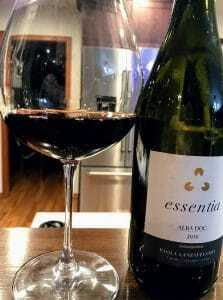 A few quick thoughts on the 2010 Paola Lanzavecchia Essentia blend from Alba. Paola is a third generation winemaker in the Serralunga d’Alba region of Piedmont, following in the footsteps of her father, Daniele, and grandfather, Pietro Lanzavecchia, who founded the family estate in 1959. A graduate of enology and agriculture from the University of Turin, Paola Lanzavecchia assists her father with the family’s Villadoria wines while also making wines under her own label. Kerin O’Keefe notes in Barolo and Barbaresco: The King and Queen of Italian Wine, that while Lanzavecchia is on a “perennial quest to raise the bar on quality” she still sticks to mostly traditional winemaking methods. The 2010 Essentia is a blend of 80% Nebbiolo, 15% Barbera and 5% Merlot. While the Nebbiolo is harvested normally, the Barbera and Merlot are allowed to partially desiccate on the vine prior to harvest. It’s a treatment kind of between a super ripe late harvest Napa and letting the grape fully dry out like Amarone. The wine is aged for 9 months in 2nd and 3rd year French oak barrels. This wine has juicy Rainier cherries with spicy, floral notes. High intensity bouquet. Pop and pour there is a gorgeous mix of flowers (both fresh and dried rose petals) with tobacco spice. With some air the red cherry and plum notes come out. On the palate those cherry notes become more pronounced and are noticeably juicy with the medium-plus acidity–like fresh Rainier cherries. Medium-plus tannins have a soft edge to them but amply hold up the full-bodied weight of the fruit. A little star anise spice joins the tobacco spice, adding more layers. The long mouthwatering finish brings back the rose petals. Beautiful wine that more than merits its $27-33 price tag. It has a lot of character and elegance of a beautiful Barolo but the “super-ripe” Barbera and Merlot add fruity softness to balance Nebbiolo’s notoriously high tannins and acidity. It’s drinking exceptionally well now but I can see this continuing to deliver pleasure for another 3-5 years. Tagged Alba, Amarone, Barbera, Barolo, Barolo and Barbaresco: The King and Queen of Italian Wine, Italian wine, Kerin O’Keefe, Merlot, Nebbiolo, Paola Lanzavecchia, Piedmont wine, Pietro Lanzavecchia, Serralunga d’Alba, University of Turin, Villadoria, Women in wine. Going to need more than 60 Seconds to geek out about the 2016 Soaring Rooster Rosé of Counoise from Tagaris Winery. I talked a little about the Taggares family and Tagaris winemaker, Frank Roth, in my 60 Second Review of the 2015 Tagaris Pinot noir from the Areté Vineyard. In addition to the 200 acre Areté Vineyard, Tagaris also owns the 100 acre Alice Vineyard on the south slopes of the Saddle Mountains in the Wahluke Slope AVA. Named after owner Michael Taggares’ mother, this vineyard is home to many grape varieties that are unique to Washington State such as Counoise, Grenache, Tempranillo and Mourvedre. Located near Weinbau and Rosebud vineyards is Tagaris’ third estate vineyard–the Michael Vineyard. This vineyard is also planted to unique varieties like Carménère, Cinsault, Barbera and Sangiovese. The 2016 Rosé of Counoise was made via the saignée production method where juice from red Counoise must is “bled off” and fermented into a rosé. In her book, Rosé Wine, Master of Wine Jennifer Simonetti-Bryan describes how during this point the must has a higher level of alcohol compared to the short maceration method. As an extracting agent, the alcohol leaches out more color and flavor from the skins producing deeply colored and richer flavored rosés. Counoise grapes growing in a vineyard owned by the Syndicat des Vignerons des Côtes du Rhône, Châteauneuf-de-Gadagne, Vaucluse. Jancis Robinson notes in Wine Grapes, that Counoise is a very old grape variety, distantly related to Piquepoul, that was first mentioned in Avignon in 1626. The French poet Frédéric Mistral (1830-1914) claimed that the grape was of Spanish origins, being first brought to the Rhone in the 14th century during the papal reign of Urban V by a vice-legate named Counesa. While Harry Karis, in The Chateauneuf-du-Pape Wine Book, believes that Counoise originated in Provence, it was in Châteauneuf-du-Pape where the grape first gained renown in the 19th century as a key component in the blends of Château la Nerthe made by Joseph Ducos. Baron Pierre Le Roy de Boiseaumarié of Château Fortia, who helped write the original AOC laws of the region, was also a fan of the variety. He included the grape as a permitted variety for red Châteauneuf-du-Pape. More recently both Domaine du Pégau and Château de Beaucastel have championed usage of Counoise in Châteauneuf-du-Pape–even though today it only accounts for around 0.4% of all plantings. In fact, over the last couple decades Beaucastel has been decreasing their plantings of Syrah in favor of Counoise, feeling that the grape’s natural acidity, spice and late-ripening qualities serve as a better compliment to Grenache and Mourvedre. Making up to 10% of the blend for their CdP rouge in some years, Beaucastel uses the highest proportion of Counoise in the region. 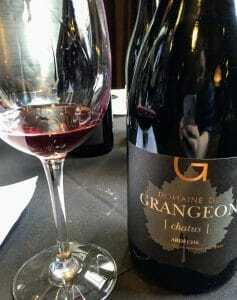 Outside of Châteauneuf-du-Pape, the grape can also be found in neighboring Gigondas and several villages permitted to use the Côtes du Rhône-Villages appellation. It is also grown in the Ventoux and can be used in the rosé wines of Coteaux d’Aix-en-Provence. In these rosés, Counoise usually sees brief skin contact as part of the short maceration method with the Counoise contributing fresh acidity, spices and dark berry fruits. For the red Counoise wines of Coteaux d’Aix-en-Provence, aromas of chocolate and leather can also emerge. Counoise vine growing outside the tasting room of Tablas Creek in Paso Robles. In the United States, Tablas Creek brought cuttings of Counoise from Château de Beaucastel to California in 1990. From there it spread to other Rhone Rangers in Paso Robles and then up north to Randall Grahm’s Bonny Doon winery in Santa Cruz where Grahm often blends it with Cinsault. 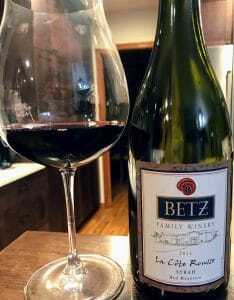 In the Livermore Valley, the Wente family makes a small-lot varietal example of Counoise. The winemaking team at Tablas Creek notes that the grape is prone to oxidation which makes it a useful compliment to the reductive nature of Syrah and Mourvedre in blends. In 2000, Doug McCrea (of McCrea Cellars/Salida) convinced Jim Holmes of Ciel du Cheval Vineyard on Red Mountain to plant Counoise from Tablas Creek cuttings. 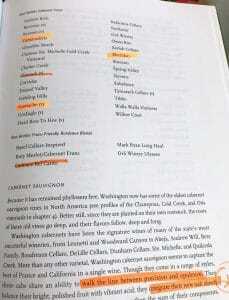 By 2012, the acreage of Counoise in Washington had grown to 15 acres with plantings in the Yakima Valley vineyards Meek and Airfield Ranch, the Alice Vineyard in the Wahluke Slope, the Needlerock Vineyard in the Columbia Valley as well as Forgotten Hills Vineyard and Morrison Lane in Walla Walla. 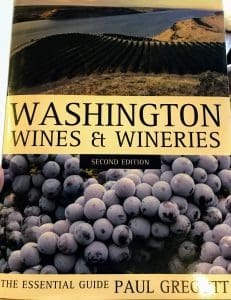 In Washington Wines, Paul Gregutt notes that John Farmer, one of the first to plant Rhone varieties in the Horse Heaven Hills, also sought out cuttings to plant at Alder Ridge Vineyard. The Wahluke Slope AVA with the Saddle Mountains in the distance. The Soaring Rooster Rosé of Counoise comes from the Alice Vineyard in this AVA. In addition to Tagaris Winery, varietal examples of Counoise can also be found in Washington from Cairdeas Winery, Cana’s Feast, Côtes de Ciel, Lindsay Creek Vineyards, Martin-Scott Winery and Syncline. Medium-plus intensity nose. A mix of raspberry and dark berry fruits. There is also a blue floral element that is intriguing. On the palate, the dark blackberry fruits dominant more and add a bit of weight to this rosé. While there is a lot of fruit, it’s dry. There is also some texture you feel on the tongue. It’s not bitter or pithy like phenolic extract but, again, adds to the overall weight of the wine. Medium-plus acidity adds a juicy freshness with even a bit of minerality peaking out on the moderate length finish. With the weight and dark fruits, this is a rosé for red wine drinkers. Its full body and richness opens it up to interesting food pairing possibilities. 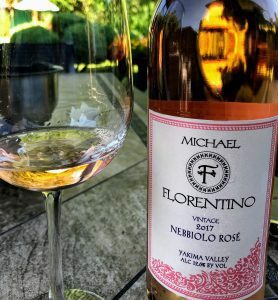 After reading Simonetti-Bryan’s Rosé Wine, I think I’ve found a rosé to experiment with for some of the more robust pairings I mentioned in my review of the book like lamb and beef brisket. 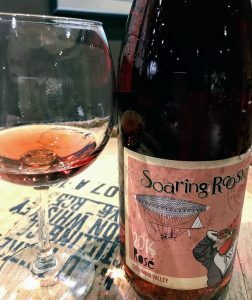 For $12-15, this 2016 Soaring Rooster Rosé of Counoise is a very solid dry rosé. It gives drinkers a lot of food pairing versatility as well as a chance to geek out with a very cool grape. Tagged Airfield Ranch, Alder Ridge Vineyard, Alice Vineyard, Areté Vineyard, Barbera, Baron Le Roy, Bonny Doon, Cairdeas Winery, Cana’s Feast, Carménère, Chateau Beaucastel, Château Fortia, Château la Nerthe, Châteauneuf-du-Pape, Ciel du Cheval, Cinsault, Columbia Valley, Coteaux d’Aix-en-Provence, Côtes de Ciel, Côtes du Rhône-Villages, Counoise, Domaine du Pegau, Doug McCrea, Forgotten Hills Vineyard, Frank Roth, Frédéric Mistral, Gigondas, Grenache, Harry Karis, Horse Heaven Hills, Jancis Robinson, Jennifer Simonetti-Bryan, Jim Holmes, John Farmer, Joseph Ducos, Lindsay Creek Vineyards, Livermore Valley, Martin-Scott Winery, Master of Wine, McCrea Cellars, Meek Vineyard, Michael Taggares, Michael Vineyard, Morrison Lane, Mourvèdre, Needlerock Vineyard, Paso Robles, Paul Gregutt, Piquepoul, Provence wine, Randall Grahm, Red Mountain, Rhone Rangers, Rosé Wine, Saddle Mountains, saignée, Salida, Soaring Rooster, Syncline, Syrah, Tablas Creek, Tempranillo, The Chateauneuf-du-Pape Wine Book, Ventoux, Wahluke Slope, Walla Walla, Washington Wines and Wineries, Wente, Wine Grapes, Yakima Valley. 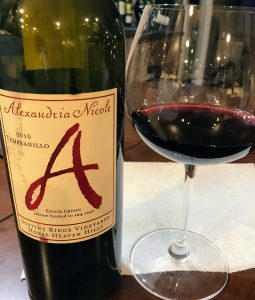 A few quick thoughts on the 2010 Alexandria Nicole Tempranillo from Destiny Ridge Vineyard in the Horse Heaven Hills. Founded in 2001, the origins of Alexandria Nicole date back to the first planting of the Destiny Ridge Vineyard by Jarrod and Ali Boyle in 1998. Jarrod was working as a viticulturist with Hogue Cellars, under the mentorship of Dr. Wade Wolfe (of Thurston Wolfe fame). While checking out vineyard sites, he noticed an unplanted south facing slope north of Alderdale that overlooked the Columbia River. Finding out that the property belonged to the Mercer family (Champoux Vineyards and Mercer Wine Estates), the Boyles and Mercers went into partnership to plant Destiny Ridge Vineyard. Today, the 267 acres of Destiny Ridge are sustainably farmed and planted with 23 grape varieties–including unique varieties like Tempranillo, Barbera, Carménère, Counoise, Marsanne, Mourvèdre, Petite Sirah, Petit Verdot and Roussanne. While the Boyles get first pick, Paul Gregutt in Washington Wines notes that fruit is also sold to wineries like Chateau Ste. Michelle, Darby Winery, Guardian Cellars, Saviah and Tamarack. The 2010 Tempranillo is a blend of 94% Tempranillo, 4% Malbec and 2% Cabernet Franc. The wine spent 20 months aging in 1 and 2 year old French barrels with 104 cases made. Medium-minus intensity nose. 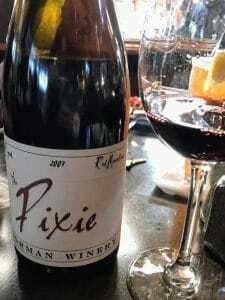 Red fruit dominant with cherry and cranberries. A little tobacco spice but very muted. Dried cranberry notes characterize this wine. On the palate, the red fruit is carrying through but is faded and dried. This dried fruit element, interestingly, seems to amplify the spice with black licorice notes joining the tobacco. Medium-plus acidity and firm medium-plus tannins add an edge to this wine that is desperately missing the fruit to balance it. This wine is probably about 3 years past it peak. That said, even at its peak, it’s hard to say this was a compelling enough wine to merit its $55 price tag. Especially when you compare it to what you can get at that price from Spain (not to mention southern Oregon), it’s clear that you are paying for the novelty of a Washington Tempranillo. Tagged Alexandria Nicole, Barbera, Cabernet Franc, Carménère, Champoux Vineyard, Chateau Ste. Michelle, Counoise, Darby Winery, Destiny Ridge Vineyard, Guardian Cellars, Hogue Cellars, Horse Heaven Hills, Jarrod Boyle, Malbec, Marsanne, Mercer Family, Mercer Wine Estates, Mourvèdre, Oregon wine, Paul Gregutt, Petit Verdot, Petite Sirah, Roussanne, Saviah, Spanish wine, Sustainable Viticulture, Tamarack Cellars, Tempranillo, Thurston Wolfe, Wade Wolfe, Washington Wines and Wineries.